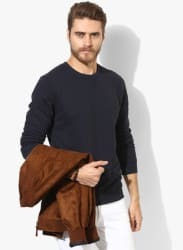 To perfect an easy going look, you must get this navy blue coloured sweatshirt from the house of United Colors of Benetton. Woven from poly cotton fabric, this trendy sweatshirt will be one of your smartest and worthiest picks till date. Team this sweatshirt with a pair of denims and sneakers for a smart casual look.